One of the first things I see every morning is my great-grandfather’s suitcase. His initials ‘S.S.’ are embossed in gold on the front, just under the worn, leather handle. It’s an odd-sized case; not sure what you’d fit in here. Maybe a weekend’s worth of clothes? Or maybe, people just traveled with less. Yes. It’s probably that. Less. I know they had less. Funny, I think I used to think that was a sad thing. Now, I think it’s a healthy, life-focusing things. And perhaps they had less because that’s what they could afford, but I’ve been thinking a lot lately about having less regardless of budget; regardless of the ability to have more. And no, that’s not just because I don’t like to do laundry. Or put things away. My great-grandfather made coddies. If you don’t know what they are, I wrote about them here. And later, he owned a grocery store in Patterson Park. I heard stories about family. About living ‘over top’ the grocery store. About helping his relatives get to this country. About how generations lived together and supported each other. About struggling. I never heard anything about him traveling. 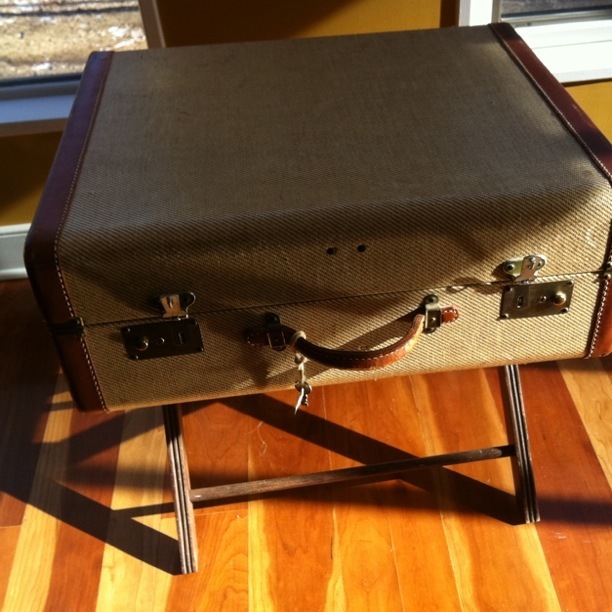 But here is this sturdy suitcase with a worn handle and a slightly frayed lining. I wonder where it’s been. < Life is like a Brussel Sprout. That suitcase sure looks like it has stories to tell. I always loved my dad’s black leather medicine bag (he was a doctor), it seemed to have special powers and a history of healing. I always loved those old medicine bags. I bet as a child, it did seem magical! But he did have a suitcase!